Best EstroG-100 helps alleviate the uncomfortable symptoms of menopause like hot flashes, night sweats, nervousness, irritability, dizziness, vaginal dryness, emotional imbalance, tiredness and insomnia. This supplement has been tested in pre-, peri- and post-menopausal women in double blind random trials and found to be effective. Angelica gigas Nakai root extract – Known as “female ginseng” for its contributory value to female health. It also keeps the circulatory system healthy. Cynanchum wilfordii root extract – Antioxidant and immune-modulatory properties. It restores energy and keeps the cardiovascular system healthy. Phlomis umbrosa root extract – Purifies the blood and helps regulate the removal of excess hormones from the body, maintaining a healthy balance. Suggested dosage for adults is 1 capsule per day with a meal. This supplement has been found to be completely safe. A bottle containing 30 capsules costs $26.99. This is higher than the average price for menopause supplements and some really good products are available for less than this price. This product does not come with any guarantee and you cannot apply for a refund if it does not work for you. 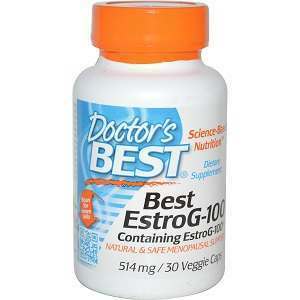 Is Best EstroG-100 by Doctor’s Best Worth buying? This supplement is made from natural ingredients and does not have any side effects. The recommended daily dosage is only one capsule, which is quite reasonable. Jackie Horowitz	reviewed Best EstroG-100	on August 21st	 and gave it a rating of 2.